I went Reel Big Fish concert a couple weeks ago featuring Starpool, The Maxies, Skapeche Mode, and Stupid Flanders at the Observatory. I didn’t get chance to share any photos. Better late than never. After watching The Maxies on the main stage with gem, I switched rooms to watch Stupid Flanders. That’s also where I ran into my friend, Amit. gem left Stupid Flanders to be sure to catch all of Suburban Legends. I missed the first half of the first song or so by the time I got over there. It was packed, and we were separated. After Suburban Legends’ set, I switched back to the Constellation Room for Skapeche Mode. 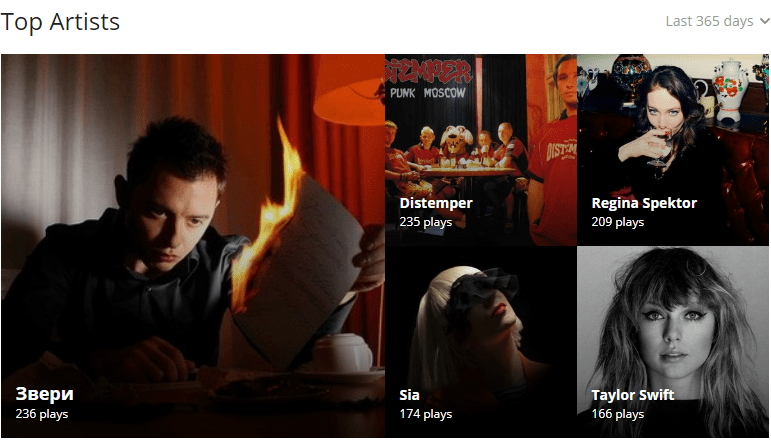 Can you guess that they do Depeche Mode covers? I got nice and close! Skapeche Mode has great energy, and I love fun 80s tunes. Plus, they’re pretty friendly! I actually ran into Bryan, the trumpet player, at SDCC. gem managed to find me at this point even though we couldn’t text. Signal was so bad that our text messages were actually lagging by 20 minutes or so. After their set, gem and I chatted with Bryan briefly, and I got this photo with Skapeche Mode’s singer. Note the David Bowie homage. Last was Reel Big Fish. By that time, I just wasn’t feeling it too much anymore. Plus, there was a lot of weed around us, so we left after a couple songs. We did, however, run into Brian Klemm, guitarist for Suburban Legends. I think this is the happiest I’ve ever seen gem. Plus, when I asked Klemm about the band since this is their last tour, he confirmed that they’re not breaking up and should still be playing locally. Awesome! This entry was posted in Events, Journal, Music, Photos and Screenshots and tagged concert, music, reel big fish, ska, skapeche mode, stupid flanders, suburban legends, the maxies on January 28, 2016 by TheUser. Last night was the fifth annual Ska Luau at the House of Blues Anaheim, and it was an awesome show! I was ready to go with a new (or at least never worn to a concert) Half Past Two shirt, and despite it being 42 degrees outside, it was nice inside! The show opened with the Magnolia Polynesian Dance Troupe. They did dances from a bunch of a different countries and had both men and women, but I didn’t record very much. The first band to perform was Failed to Victory. I’ve seen them before, and they’re great. I’d never heard Skadonna, but they were really fun. You might guess that they perform Madonna covers. I’ll admit, the songs that I didn’t know weren’t as cool, but I really enjoyed hearing the covers. Los SuperSpies graced us with their debut! Not all of their songs were new to me though. Here they’re playing The World is New. If you’re a fan of Save Ferris or Starpool, you’ll probably become a fan of Los SuperSpies too! Half Past Two is one of my favorite bands, so it was awesome that they performed as well. Hey, look what I just found. Sorry, that has nothing to do with the Ska Luau, but it came up as a recommended video at the end of the one I recorded. I didn’t know they covered this, and I like Vampire Weekend. Back to the Ska Luau! Here some friends joined Half Past Two on stage. Suburban Legends! Another one of my favorite bands! I love their awesome choreography (and music of course). This little guy was rocking out too! Well, honestly, he was mostly napping. But his parents were enjoying the show. There might have been a surfing contest too. Competition is fierce when a prized pineapple is on the line. It was such a terrific show with a truly amazing line up. Spending the 30th with excellent ska and the 31st, tonight, with friends is a great way to end 2014. And the best way to end a night of ska is carne asada fries. My diet was upset, but my taste buds were happy. This entry was posted in Events, Food, Holidays, Journal, Music, Photos and Screenshots, Shows and tagged concert, failed to victory, half past two, house of blues, los superspies, magnolia polynesian dance troupe, save ferris, ska, ska luau, ska luau v, skadonna, starpool, suburban legends on December 31, 2014 by TheUser. Tokyo Ska Paradise Orchestra gave an awesome performance yesterday at The Observatory! Half Past Two posted about it, but I wasn’t planning on spending money. However, when Max talked to me about it at this week’s Ska Parade Lounge on Wednesday, he convinced me to go. I’m glad he did! I’d never been to The Observatory in Santa Ana, but it was a pretty sweet venue. Reviews on Foursquare seemed pretty negative honestly, but I thought things were fine. There was a lot of space and multiple tiers as well. Multiple tiers also means multiple walls on which to lean so there’s a lot of room for people who want to take it easy. The show opened with Viernes 13, a ska band from LA. Before they started, I noticed that the woman next to me was with a man who kept leaving for long periods of time. As it turns out, he was the keyboard player. I seem to be running into a lot of Spanish ska lately! They were fun with a good variety of music, including a Skatalites cover. I talk to the guy on keys, Francis “The BubbaMaster” Sanchez (assuming their Facebook is current), a little after the show too. Skapeche Mode performed second. Given their name, it should be no surprise that they play ska covers of 80’s music. Their Facebook says that they’re “Committed to ruining both the eighties and ska, one show at a time.” Well, they certainly weren’t ruining either because they were awesome. Skapeche Mode had awesome stage presence – especially the singer and horn section. Is the trumpet played Bryan Lackey, the same trumpet player from Failed to Victory? Did I somehow see him two nights in a row? Rad, because he’s great! I know what you were thinking. You wanted to check out what they sound like considering these jerks aren’t on Spotify. There you go. Last but not least we have Tokyo Ska Paradise Orchestra, a ska band all the way from Japan! Composed of drums, percussion, trumpet, trombone, tenor sax, baritone sax, vocals, guitar, bass, and even a melodica, they really rocked! They just had so much energy and really commanded the stage and enthralled the audience. I particularly enjoyed the bari sax player. Also, and I’m sorry if it’s weird that I noticed, but their clothes, especially their jackets, fit. It’s rare. I know you’d be sad if you got to see a bad video of Skapeche Mode but no bad video clip of Tokyo Ska Paradise Orchestra, so there you go. They do have an album on Spotify too, so check them out. One thing I really liked them about them is that despite having guitar, bass, and vocals, I really felt like the horns stood in the spotlight. Their line up isn’t very different than a lot of full ska bands (besides the melodica), but normally it seems like vocals take center stage with guitar and horns standing side-by-side. I liked the feature on the horns! They also did a fantastic rendition of the song from Tetris. How could I not fall in love with that? Another successful ska night! At the beginning of the night, I’d never seen these three bands. By the end of the night, I have three more bands I’d love to see again in the future! This entry was posted in Events, Music, Photos and Screenshots, Shows, Videos and tagged 80's music, bryan lackey, concert, depeche mode, failed to victory, half past two, melodica, music, santa ana, ska, skapeche mode, the observatory, the skatalites, tokyo ska paradise orchestra, viernes 13 on October 10, 2014 by TheUser. Friday night was Ska & Punk Night 5 at Centerfield Sports Bar & Grill in Huntington Beach. Half Past Two posted about it, which is how I found out. Stupid Flanders was headlining, and somehow they didn’t actually post about it until after Half Past Two despite HP2 not performing in it. The line up was Not A Chance, Failed to Victory, Revancha, and Stupid Flanders, with Stupid Flanders being the only band I’d seen. Not A Chance, a punk band, played first. I noticed that Max, guitarist and vocalist for HP2, was there, so I said hello between sets. gem and I ended up joining him. Failed to Victory is pictured at the top. For some reason, my clip of them won’t upload to YouTube and has no audio when I try to play it on my PC. It’s fine on my phone and on Instragram though. Despite a long wait as they fixed a blown out amp, F2V was really good! Unfortunately, it got so late that we didn’t stay for Revancha or Stupid Flanders, but I’m really glad to have learned about Failed to Victory. Plus it was cool to hang out with Max! This entry was posted in Events, Music, Photos and Screenshots, Shows and tagged centerfield sports bar & grill, concert, f2v, failed to victory, half past two, hp2, music, not a chance, revancha, ska, spa & punk night, stupid flanders on September 27, 2014 by TheUser. It’s a Ska World After All! 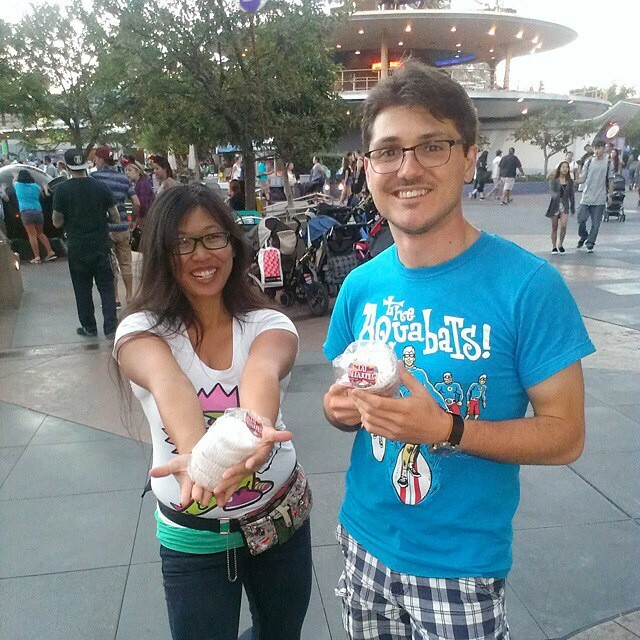 Sunday was the 4th annual Ska Day at Disneyland! I’m pretty glad I found this flier at The Skatalites’ concert at Slidebar last week. The festivities actually started Saturday night. There was a pre-party at Las Palomas Mexican Restaurant in Anaheim. I went with Edward and gem. I guess there was a call-out, because there was some staffing and service problems. It was fun anyways! I noticed that we were sitting next to members of the ska band Half Past Two! There was a hat dance, musical chairs, dance competition thingy! Basically, there was a circle of people, and one person had to wear a hat. As music plays, the person wearing the hat has to dance across the circle and put the hat on someone else. If you’re wearing the hat when the music stops, you’re out, and it continues to another round. gem made it to the last round! The person with whom she’s dancing in the photos was the guitar or bass player (I couldn’t see) for The Pocketeers I think! She technically came in second, but they gave her a prize anyways. She got this sweet 45 of David Hillyard & The Rocksteady 7’s cover of “Evil” by Moondust Records. Pretty cool! New Single: David Hillyard & The Rocksteady 7 “Evil” : Moondust Records. On Sunday, we started the day by trying on some hats. 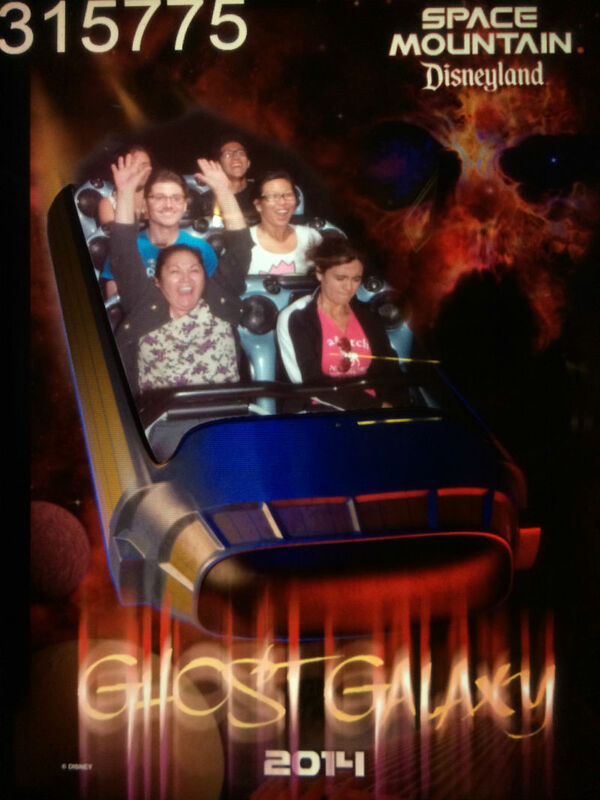 Next we went on Space Mountain. We didn’t even realize it was already Ghost Galaxy! We had lunch at the Hungry Bear Restaurant for the meet and greet. After we sat down, we noticed we were sitting next to some of the members of Half Past Two again. Cool coincidence or destiny? We chatted for a bit with out new friends and took this photo! 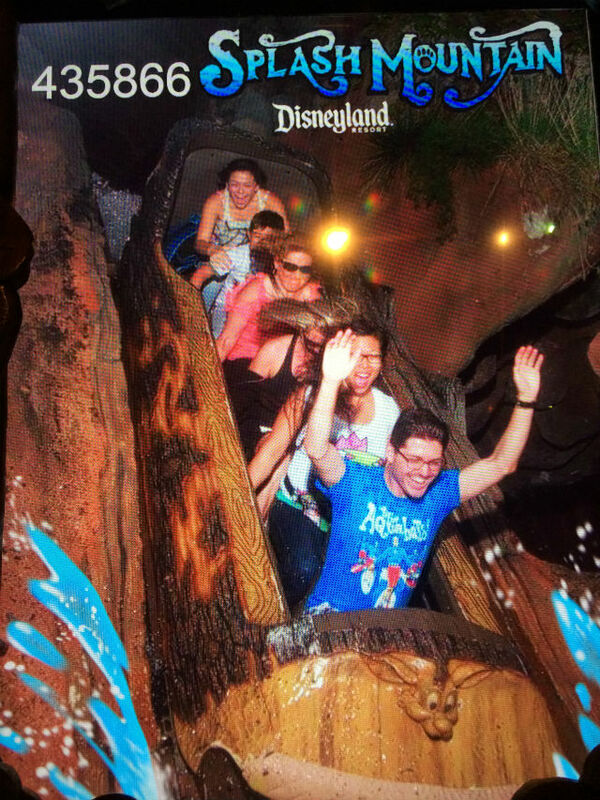 While in line for Splash Mountain, we met two women from Sacramento here on vacation. We had fun talking to them, and then I got soaked on the ride. We also gave them our fast passes to Indiana Jones because we were running late for the group photo. This is as good as a group photo as we were going to get, because we were a little late. Oh well. Look how many security guards it takes to deal with ska fans! There were actually a few more here at one time. Let’s skip over the negative part of the day. 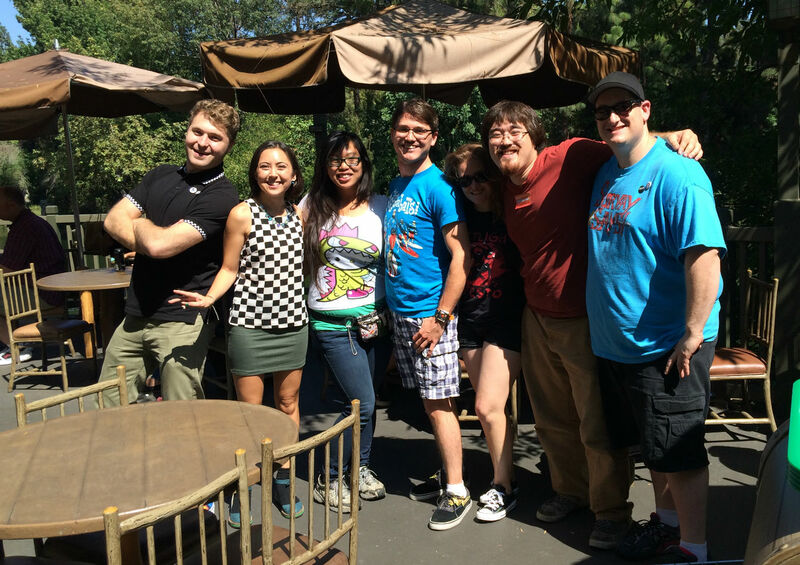 After the group photo, we all went on Big Thunder Mountain Railroad together! We had a rather large group. The plan was to ride It’s a Small World together as well, but gem and I decided to go on Indiana Jones instead. This is not a good place to leave a diaper. We also managed to go on some rides that didn’t involve photographs. 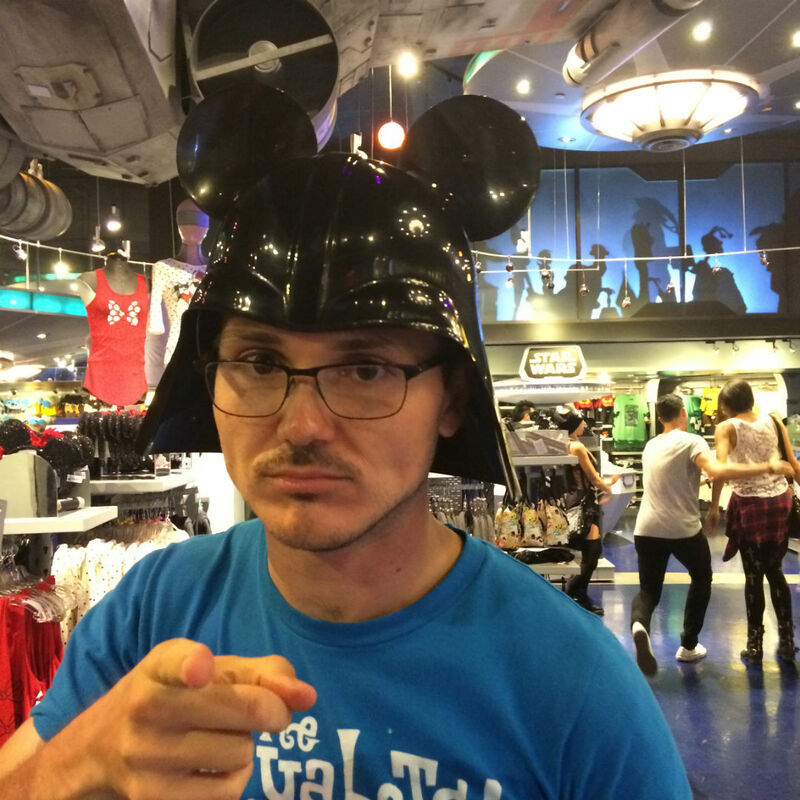 For example, we had to go on Star Tours of course (twice!) as well as the Haunted Mansion to see its Nightmare Before Christmas version. We played a lot of Heads Up, a game gem introduced to me, on our phones while in line. It seemed to be a popular game with other people as well, and we even told others about it. There was a woman in line with us for the Haunted Mansion who downloaded it after we told her about it, and then we played with her and her son too! 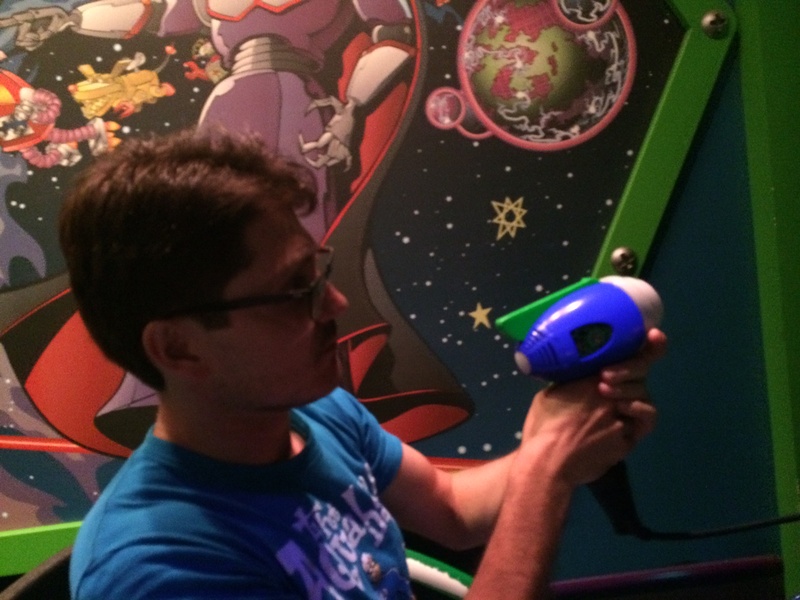 I also battled the Evil Empereror Zurg! And another Toy Story shot. 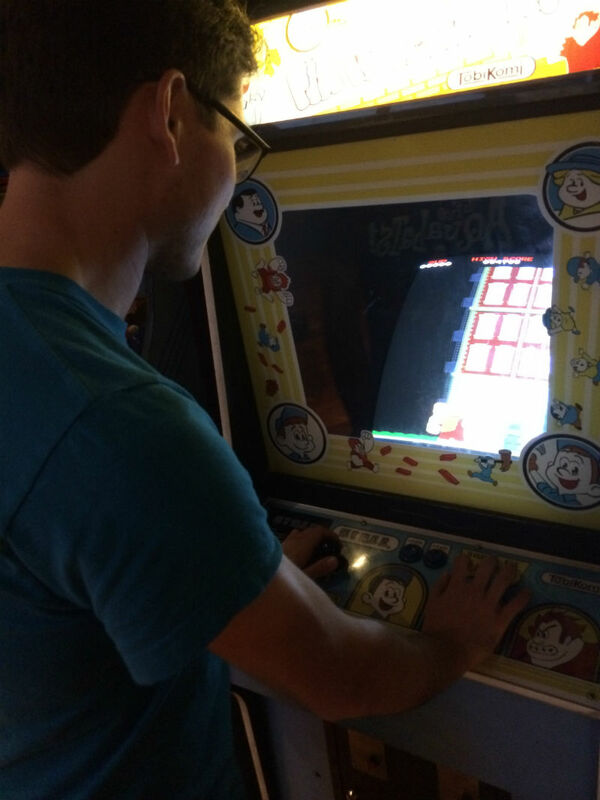 Before the concert, I just had to play some Fix It Felix Jr. While we were waiting for the show to begin, we saw that the latest It’s a Ska World SKAvenger Hunt goal was near us. We headed there and got there first, winning some Dulce Cookies by Melo! Oh my goodness, they were so amazing. We gave two to Remy, the host, for him and girlfriend as well as one to a woman who got there after us. Then I ate some more of them. They were really tasty! Next it was time for the highlight of the evening, Suburban Legends! They’re so amazing. Their sound is great, their choreography is stunning, their ability to engage the audience is always superb, and their sets consist of covers and awesome originals. There’s gem with the band! Here’s a clip of them playing DuckTales. Very awesome. I danced a lot, and boy was I exhausted. I even got to be a firework. The crowd all crouched down. They began to count to eight, using “cicero” to switch to a “Cell Block Tango” reference, and then went back to counting normally. 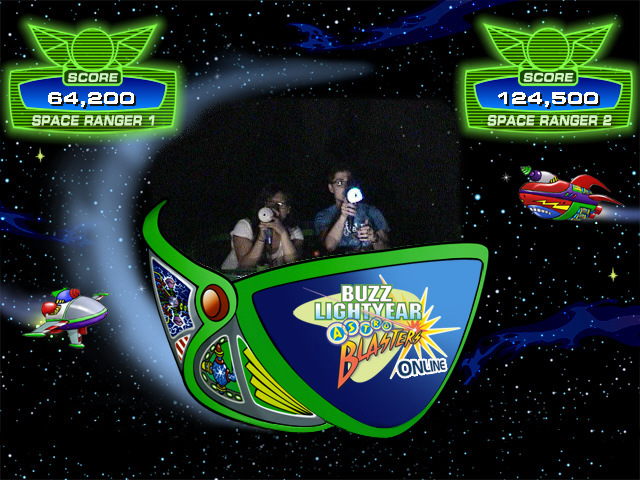 When they reached eight, we all jumped up, threw our arms in the air, and yelled, “boom!” It was fun! Also, you know how gang fights always involve singing, dancing, and hand snapping? Yeah, the audience split in two for one of those fights. Super rad. After the concert I wanted to try on this helmet even if I looked dumb. After a break, The Suffragettes, an all-girl cover band, played at the Tomorrowland Terrace. They were pretty good, but they just didn’t do enough for us. We listened to a few songs before heading back to Main Street, U.S.A. We had some delicious ice cream before calling it a night. It’s too bad that this was the fourth annual Ska Day at Disneyland and that I missed three of them. I’ll be going in the future! This entry was posted in Events, Food, Journal, Music, Photos and Screenshots, Shows, Videos and tagged astro blasters, big thunder mountain railroad, buzz lightyear, cell block tango, competition, concert, contest, dance, dancing, darth vader, david hillyard, disney, disneyland, ducktales, dulce cookies by melo, evil, evil emperor zurg, fix it felix, fix it felix jr, fourth annual ska day at disneyland, ghost galaxy, half past two, hats, heads up, hungry bear, hungry bear restaurant, indiana jones, it's a ska world, it's a ska world 2014, it's a ska world after all, it's a ska world after all 2014, las palomas, las palomas mexican restaurant, main street u.s.a., moondust, moondust records, pizza beat, pizza beat entertainment, scavenger hunt, ska, ska day at disneyland, ska day at disneyland 2014, skavenger hunt, space mountain, splash mountain, star wars, suburban legends, the pocketeers, the rocksteady 7, the skatalites, the suffragettes, tomorrowland, tomorrowland terrace, toy story, woody, wreck-it ralph on September 22, 2014 by TheUser. The best way to spend your Tuesday night is listening to live ska music. Duncan and I went to the Slidebar early to ensure we got wristbands. By 7:40 or so we had our wristbands, so we only had to wait slightly under two hours for the music. I got some tacos and nachos, found a sliver of bar to use, and began eating. I thought I recognized the guys next to me as frequenters of the Ska Parade Lounge, so we chatted a bit, and I was right! I spent the two hours chatting with Amit, Stephan, Christian, and Duncan as well as people watching. The Steady 45’s took the stage first, and they were excellent. I’d seen them at the Slidebar once previously – at the January Ska Parade Lounge opening for the Originalites. I think Collin was at the show actually. They have a standing bass! Definitely good stuff. The Skatalites were skamazing. They were one of the first ska bands, forming in 1964 in Jamaica. This year they’re celebrating their 50th anniversary! From what I can tell, all the founding members except one have passed away. Doreen Shaffer is still alive and active, singing for the band! They also performed with guest Sultan Ali a.k.a. the Sultan of Ska, son of Prince Buster (the Jamaican singer-songwriter and producer). The Sultan of Ska is the leftmost person in that photograph. It was a great show, and I’m thrilled to have seen such an influential ska band. After spending three hours dancing, however, now I’m exhausted and my ears are ringing. If you ever get the chance to see The Skatalites, I recommend you take it! This entry was posted in Events, Journal, Music, Photos and Screenshots, Shows and tagged concert, dancing, doreen shaffer, duncan, fullerton, jamaica, prince buster, ska, ska parade, ska parade lounge, slidebar, sultan ali, sultan of ska, the originalites, the skatalites, the steady 45's on September 10, 2014 by TheUser. With another month comes another Ska Parade Lounge. The opening band was The B-Sharps. 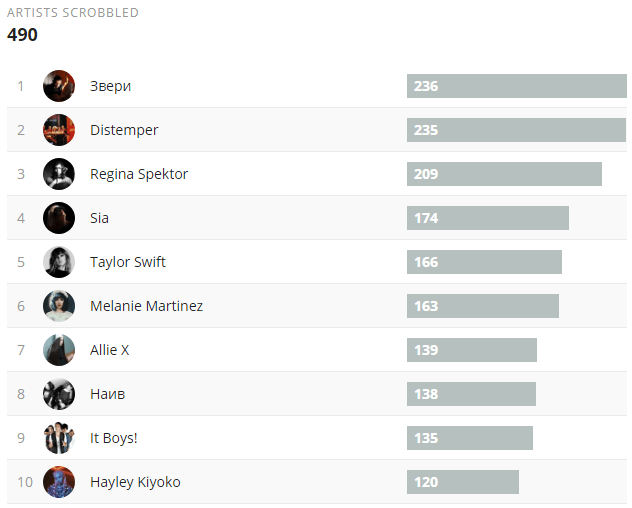 I’d never heard them, which actually made them the band I was most highly anticipating. They had a nice sound with two horns and a lot of energy! I saw Half Past Two about a month earlier at the Wet Hot Samerican Summer concert. I love the singer’s voice (although her mic was picking up a lot of feedback). The last time I saw The Maxies was with Reel Big Fish, Mighty Mongo, and The Pietasters back in January. Honestly, I didn’t like them very much, but I like them a lot more now. They were fun, and I like their shtick. BiPolar Bear Tom made an appearance, danced around on stage, and then joined the dancers in the audience. The Originalites are a great band that I’ve seen a couple times, most recently at January’s Ska Parade Lounge. I like their reggae/ska mix, although I was pretty tired from dancing (and staying out late). They played some new music for us too, which was cool. Hopefully my ears will stop ringing soon. This entry was posted in Events, Journal, Music, Photos and Screenshots, Shows and tagged concert, half past two, music, ska, ska parade, ska parade lounge, slidebar, the b-sharps, the maxies, the originalites on September 3, 2014 by TheUser. Last night I saw GOGO13 with The Hawkline Monster at Irvine Regional Park as part of the OC Parks Summer Concert series. I had a very fun time. I got there at the same time as my brother; I was right behind him as we parked. The bands hadn’t started yet, so I said hello to Tazy and headed toward the food trucks. I had to get the Piggy Dog from the Stuff NIt Burgers + More food truck. It was a hot dog with savory pulled pork on it. And then I made the mistake of going back for “Mexican Fries,” which are basically carne asada fries. They were good, but I really didn’t need more food. I also got some free tickets to another ska show. Yay! 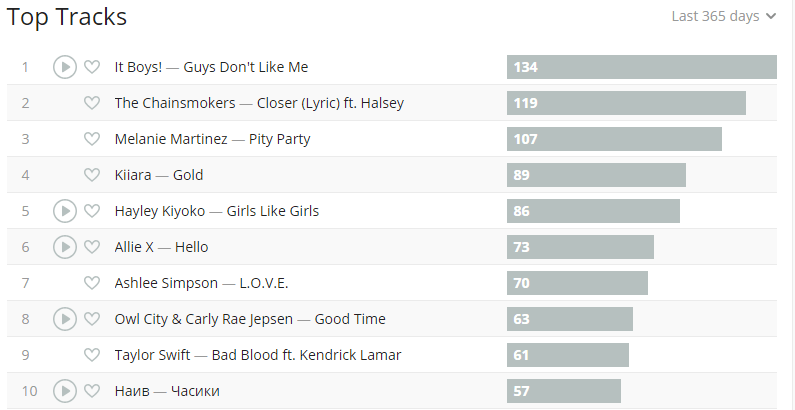 GOGO13 was a lot of fun and played basically every song I love by them. Here’s Parker Jacobs playing the ukulele. After the song ended, he realized his ukulele wasn’t connected. He sure got the kids excited! Of course, he had to show them what to do with their hands. At the end of the night, I had to get Parker Jacobs to pose with that ukulele! On my way out, I succumbed to the call of another band t-shirt. In my defense, it was cool. This entry was posted in Events, Food, Journal, Music, Shows and tagged band, concert, gogo13, irvine regional park, oc parks summer concert series, ska, stff nit burgers + more, the hawkline monster on August 1, 2014 by TheUser.